Companies wasted no time announcing plans to use some of their steep tax savings to boost their workers. Wells Fargo (WFC) and Fifth Third Bancorp (FITB) said they plan to hike their company-wide minimum wages to $15 an hour. Other firms including Comcast (CCZ) and AT&T promised $1,000 bonuses. 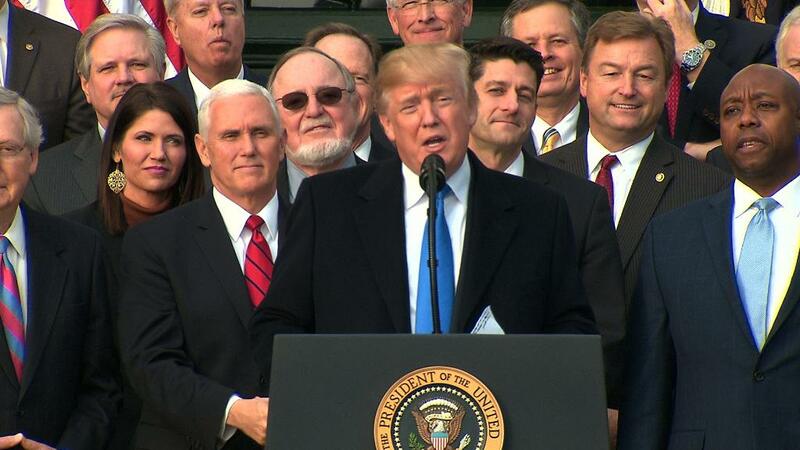 Congressional Republicans on Wednesday pushed sweeping tax reform legislation through both chambers, and it now heads to President Trump for his signature. Among other things, it will slice the corporate tax rate to 21% from 35%. Related: 14% of CEOs plan large capital investments in U.S. The White House has argued strenuously that the measure will be a boon for workers, as companies plow their tax savings into wages and jobs. Many economists argue that corporations will use the funds to benefit their investors through stock buybacks and bigger dividends. Exactly how it will play out remains a topic of fierce debate. Here's a rundown of what companies are pledging they'll do for workers. The telecom firm said it will give 200,000 employees a $1,000 bonus. In a statement, AT&T CEO Randall Stephenson hailed "Congress, working with the President" for taking a "monumental step" that will "create good-paying jobs." The aerospace giant said it will spend $300 million on workers. The funds will be split evenly among worker training, upgrading facilities and a program that matches employees' charitable contributions. Boeing CEO Dennis Muilenburg "praised" the tax bill as "a critical driver of business, economic growth and innovation for the United States and for Boeing," according to a press release. The telecom firm, which owns NBCUniversal, said it will give out "special" $1,000 holiday bonuses to more than 100,000 "frontline and non-executive" employees. Comcast also expects to "spend well in excess of $50 billion over the next five years investing in infrastructure to radically improve and extend our broadband plant and capacity, and our television, film and theme park offerings," according to a press release issued Wednesday night. "With these investments, we expect to add thousands of new direct and indirect jobs." Two company spokesmen confirmed the announcement was tied to tax reform. The financial services company says it will raise its company-wide hourly minimum wage to $15, signaling a pay raise for about 75% of its employees. The bank also pledged to give out $1,000 bonuses to about 13,500 of its workers. CEO Greg Carmichael attributed the move to the tax legislation. "The tax cut allowed the bank the opportunity to reevaluate its compensation structure and share some of those benefits with its talented and dedicated workforce," the company said in a statement. The mega bank said it will hike its minimum hourly pay rate to $15. That will mark a $1.50 increase over the company's current minimum of $13.50 per hour. Wells Fargo said the new minimum will become effective in March 2018. The bank also said it will increase its charitable giving by about 40% to $400 million.